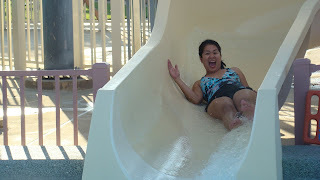 This picture was taken while I was at the end of the slide just before the pool area. Like what I've mentioned in my other post at www.lifeandhealer.com, we went to the water park in Hurst to attend a birthday party last Friday. While we were at the top waiting in line to slide, I jokingly told my friend that I am so scared that I thought I was going to mess my pants. Nelly was the first one to slide, followed by me, then Maila. The life guard could not help to laugh because we were like crazy women screaming on the slide. And when I got done sliding I looked at the corner of the pool and I saw an old man also laughing at us. haha. I am not to brave to do slide, but let me tell you after I experience that, I think I would do that again. We'll see. Done with our links...sorry for the confusion. It's ok now. Cheers! Great slide!